General William is remembered as the General who lost Vietnam. Many historians agree that Westmoreland would deny or invent facts when he felt his reputation was at stake. For instance, the General would often underestimate enemy strength even though his own headquarters would project a higher and more accurate number. He also infuriated and alienated the marines who felt Westmoreland lacked confidence in them. This proved true when a call to the Joint Chiefs of Staff from Westmoreland stated, his belief that the Marines were not prepared for certain key operations. Vo Nguyen Giap was the Vietnamese General for the NVA. He was first appointed Interior Minister for the Democratic Republic of Vietnam by Ho Chi Min in 1945. Over the next several years he successfully drove the French from North Vietnam. Giap’s troops were even credited with capturing French positions until the French surrender and the end of the Indochina war. Giap then served as minister of defense and commander in chief of the DAV. In 1967, Giap oversaw the planning for the entire offensive. Even though it proved a disaster, Giap still achieved some political goals to show that North Vietnam was far from being defeated. 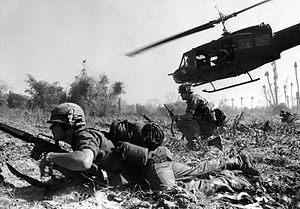 Following the US withdrawl of troops after Peace talks, Giap continued to command North Vietnam forces that finally captured the South Vietnamese capital of Saigon in 1975.